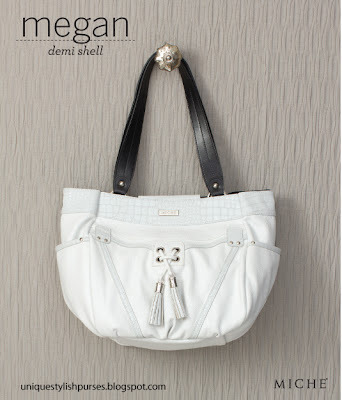 Megan is very low on inventory so if you want Megan don't wait, order now before it's too late!The Megan Shell for Demi Bags is gorgeous at first glance, but her beauty really becomes apparent when you take a close look at her carefully crafted details! Snow-white pebbled faux leather features perfectly-placed white croc accents. A pair of tied tassels provides a retro touch with modern flair. Stylish rivets in all the right places complete the look of this architecturally intriguing Shell!